Get ready to watch the greatest Marvel movie event ever held at your local AMC Theatre on May 3rd! 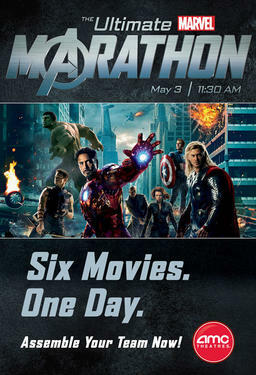 Experience THE ULTIMATE MARVEL MARATHON with six movies on one epic day. Watch the heroes’ stories unfold as they assemble for the midnight premiere of The Avengers 3D! Here’s a list of the six movies being shown at THE ULTIMATE MARVEL MARATHON: Iron Man, The Incredible Hulk, Iron Man 2, Thor in 3D, Captain America in 3D, The Avengers in 3D.